A highly recruited prospect at Bowling Green, James Morgan passed for over 2,000 yards and 16 touchdowns—a Green Falcons freshman school-record—in seven starts in 2016. He lost his starting position after three games as a sophomore and transferred to Florida International. The redshirt junior has improved as the season evolved, and he played well the last two weeks against Arkansas-Pine Bluff (FCS) and Middle Tennessee, passing for 652 yards and six touchdowns. At 6-foot-4 and 213 pounds, the Panthers’ quarterback is a classic pro-style passer with a rocket arm and high football IQ. “James is more the type to sit back in the pocket and carve a defense up. The ball is going to get there. It’s kind of hard to jump some of his throws,” middle linebacker Sage Lewis stated in August. The Rice defense is dreadful and shrewd CFF managers have taken advantage of the Owls’ weak defense—surrounding over 39 points per game—all season. Morgan is in a stupendous spot to produce an abundance of fantasy statistics this weekend. Oddly, the quarterback who eventually earned the starting assignment over James Morgan at Bowling Green also makes my CFF sleepers list this week. 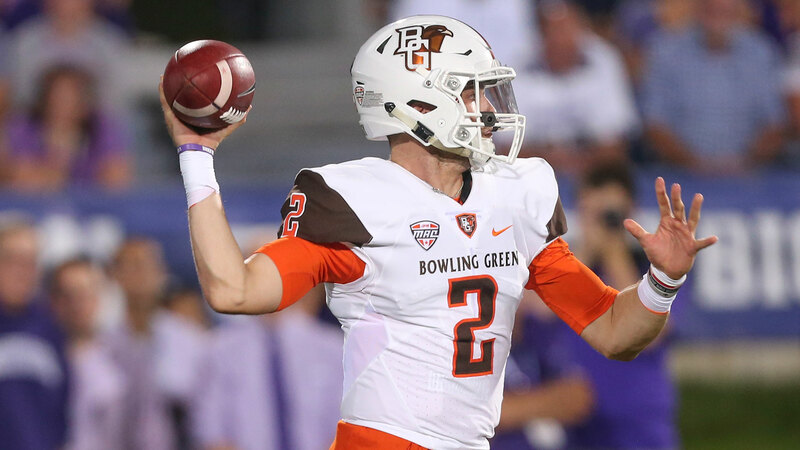 In 2017, Jarrett Doege started five games as a true freshman and produced one of the better rookie seasons in Bowling Green history. He passed for over 250 yards four times and totaled a season-best four touchdowns against Toledo. Expectations for the sophomore signal caller propelled him among the top 32 CFF quarterbacks drafted (81% ownership) over the summer. Looking at the ownership percentage currently, many owners have dropped Doege from their rosters. The Green Falcons’ rifleman has been devalued this season: He has thrown for over 1,800 yard and 18 touchdowns. He also scored two time on the ground. Why is he so undervalued? Go grab Doege this week against Ohio as a huge underdog: He is likely to put the ball in the air over 45 times and manufacture copious fantasy points. A perfect storm foreshadows ground game goodness for wise CFF managers between Georgia Southern and New Mexico State. The Eagles triple-option faces off against one of the worse run defenses in the nation. The Aggies allow 256 rushing yards per game and opponents have scored 22 rushing touchdowns. Wesley Fields ranks among the top ball carriers in school history with 2,457 career yards. The redshirt senior is in the mist of his best campaign at Georgia Southern. At the halfway point of the crusade, he is on pace to set career highs in nearly every rushing category, earning double-digit carries in six straight games. As a big favorite, the Eagles will pound the pigskin all Saturday afternoon, and Fields easily surpasses the century mark for the second time this season. In less than 48 hours, Joshua Kelley ownership on Fantrax increased from 17% to 35%. I can’t believe that he is not retained in over 60% of leagues yet. If for some reason, the UCLA runner remains on the waiver wire, CFF diehards must acquire him immediately. Kelley is undoubtedly the best runner in the Bruins’ backfield, and the offensive star of the team. Since conference play started, Kelley has earned more carries each week and the offense has transitioned to a running game. The Bruins ran the football 55 times and threw only 15 passes against California on Saturday. Kelley has exceeded 100 yards rushing in three consecutive games (124, 125 and 157) and scored four touchdowns. Also, he has snatched eight passes for 57 yards in the last three contests. “He’s (Kelley) one of those guys that I think people gravitate to because he has a positive energy and aura around him,” Coach Chip Kelly stated. “I think he sets a tone whether he’s in a practice session for offense or with the rest of the team or in a classroom.” Kelly’s club is favored at home, and the UCLA tailback will surely garner well over 25 touches in a positive game script for the ground game. Unfortunately, there are only two Big 12 games on the menu this week, and CFF owners will have to settle for a main course elsewhere. I am very excited about the Sooners-Horned Frogs game and analyzed the rosters for scoring opportunities. Wide receiver Jalen Reagor looks like a great selection as an appetizer. The game script projects an Oklahoma lead in the second half, and TCU will throw on the vast majority of downs late in the game. Despite an injury to his non-throwing shoulder, quarterback Shawn Robinson has continued playing and looked much better (and healthy) two weeks ago against Texas Tech. As Robinson improves, Reagor should garner more targets and opportunities to succeed. In four of six games, he has scored over 13 fantasy points and averaged 13.4 points per game in ½ point-ppr formats. The sophomore playmaker reaches the end zone and exceeds 100 yards receiving for the first time this season. One of my bucket list items is to visit Boise, Idaho and watch the Broncos play on the blue turf at Albertsons Stadium. I’ll never forget the first time watching Boise State play and treasure the Chris Petersen-Kellen Moore campaigns from 2008 to 2011. Enough nostalgia…It is time to look at this week’s matchup between Boise State and Colorado State. How confident is DraftKings in the Broncos’ aerial assault against the Rams? Quarterback Brett Rypien is priced well over $10,000 on the Friday night slate, which is more than Tua Tagovailoa and Kyler Murray on Saturday. Colorado State has bled yards to opposing signal callers and receivers all season, allowing over 243 passing yards and 35.1 points per game. The Rams have also yielded 19 aerial strikes. A.J. Richardson leads Boise State in average per catch (15.9) and touchdowns (4) on 27 catches for 430 yards. The home run hitter easily gets open vertically for a touchdown beyond 50 yards against the Rams on Friday night.